It was a beautiful night last night. The sky was clear and dark (moon at 2%). Due to some power problems at Tranquility Base, Dave and I had to divert to the observatory in Huntsville. By the time we arrived, it was dark, so it was good to practice assembling my entire imaging rig almost entirely by touch. I had a little issue with balance due to using my older side-by-side saddle because I wanted the faster f/4 focal ratio of my camera lens versus my f/7 refracting telescope. The configuration is a little wonky and whether it works well or not depends greatly on where the target is in the sky relative to the meridian. This also impacts my star alignment routine because in order to get the parallel imaging element and guide element pointed the right way using the saddle, I have to rotate the equatorial mount head 90 degrees on the declination axis. I can’t prove this should cause an issue, but it seems to always give me trouble – so maybe it’s just me. The result is longer/multiple alignment passes and often missing targets on the slew stop. This happened last night. I was trying to locate NGC 6888 for my first bi-color narrow-band attempt. 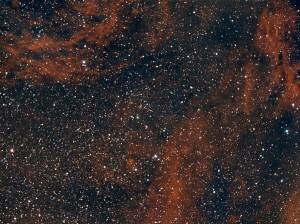 Cygnus was high in the sky and I felt really excited about having a solid imaging run ahead. The only problem was – I never found the target. After several hours of tinkering, I decided to just image where I was at and try another night for the Crescent. 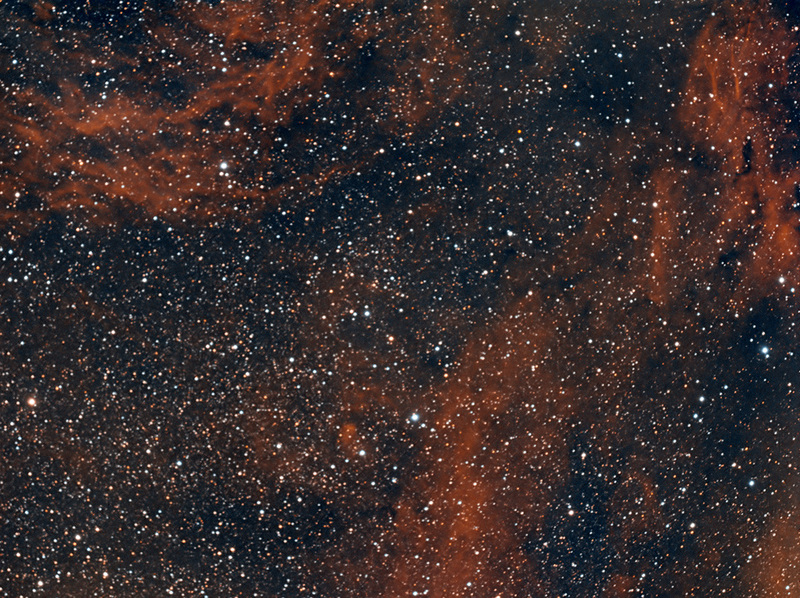 It wasn’t until I plate solved the result that I found I was somewhere very near IC 1318, the diffuse emission nebula surrounding Sadr (or Gamma Cygni). I was close, but the temperature was quite surprisingly dropping and I wanted at least something to practice with in post. I love being barefoot. Somehow I must have subliminally “forgotten” my shoes when I left the house and I also just-so-happened to be in my usual uniform of shorts and tee-shirt. When the temp bottomed out at 59 Fahrenheit, it was time to pack up and head home.